Each year, Mexic-Arte Museum showcases the work of up-and-coming artists in its Young Latino Artists exhibition. This twenty-second year, guest curator Alana Coates has brought together eight Latinx Texas-based artists whose work speaks to our tumultuous political moment: a time of Trump, racism, and disinvestment on one hand, and continued perseverance and struggle on the other. The artists exhibiting include Nansi Guevara (b. 1988 | Laredo, Texas), Daniela Cavazos Madrigal (b.1991 | Laredo, Texas), Andrei Rentería (b. 1986 | Chihuahua City, Mexico/ Presidio, Texas), Mark Anthony Martinez (b.1987 | San Antonio, Texas), José Villalobos (b. 1988 | El Paso, Texas), Paloma Mayorga (b. 1989 | Austin, Texas), Michael Martinez (b. 1991| San Antonio, Texas), and Ashley Mireles (b.1986 | San Antonio, Texas). These artists grapple with a range of interlocking issues: queerness, gender, Aztec aesthetics, border aesthetics, class, liberatory ways of depicting the body, religion, syncretism, nationality, race/ethnicity, browness, blackness, whiteness, murder and torture by state and drug violence, relationships - romantic to familial, and how to remember, reclaim, and rethink colonial histories. For instance, Michael Martinez’s 3-channel video piece Time Immemorial is a powerful meditation on Chicanx queer people (and Latinx queer people in general), and on the process of making more space for their recognition. Martinez interweaves ancient and contemporary imagery, presenting Aztec sculpture such as the well-known statue of Coatlicue, modern paintings of Aztecs such as those by Jesus Helguera, specifically one of the often-seen paintings of Prince Popocatépetl and Princess Iztaccíhuatl (here transformed into two prince-soldiers embracing), and photographic landscapes with passages of text asserting queer Mexican existence and persistence. “Nosotros, nosotrAs, nosotr@s, nosotrxs” - each appears upon the screen in succession. They come across as changes in title, revising toward a more overt and open naming, but as references to people always existing, rather than new. The video also presents snippets of a founding story, and future story: “We came from the ground,” it begins, referencing Aztec origin histories, and perhaps contemporary rebirth in the face of longstanding oppression and violence. Paloma Mayorga’s photographic self-portraits, meanwhile, depart from conventional representations of femme bodies. Executing self portraiture that uses a different visual language, Mayorga shows various body parts in isolation, pressed against glass and among watery plantlife and other earthly materials such as salt. It’s a form of representation that references beauty, but which departs from normative codes for suggesting feminine bodily beauty. Mayorga reflects on how bodies interact with spaces that are at once constructed and natural. Her imagery appears more interested in the questions, “What can a body do? How can it interact and feel?” than it is in, “What does this body look like?” Mayorga describes these works as interwoven with healing from the normative pressures on femme and of-color bodies, and from a society that drives a wedge between human bodies and other parts of the earth’s systems. Elsewhere, in a corner of the gallery, Nansi Guevara’s work creates an altar-like space. The large central panel is an image of four brown women in a circle, two appearing youthful with brown hair, and two elderly with white. They are sewn with vivid lace fabrics, the background a bright pink, the text “Siente nuestrx poder” in a contrasting blue. The size and style of the mural evoke Christian churches’ visual vocabulary, but the content is now a direct assertion of, and call for, women/femmes-of-color power. Coates has assembled a powerful group of artists who all achieve a thought-provoking balance of activist concepts and visual interest. Visiting the exhibit may guide you in processing the conditions we live in, or rejuvenate your coping practices and skills for seeking change. 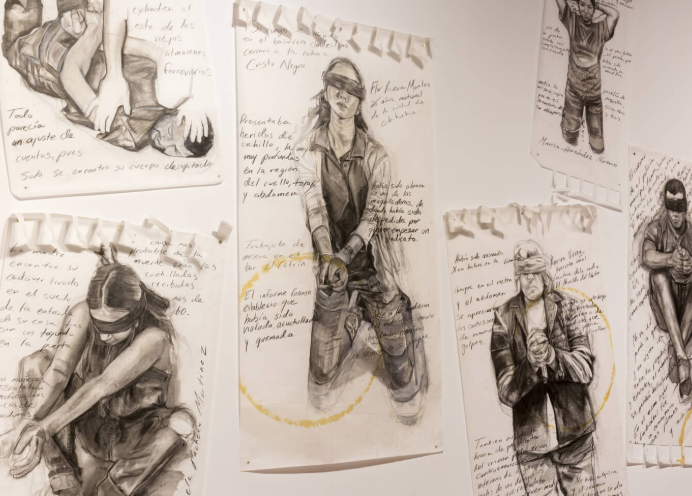 Daniela Cavazos Madrigal considers language play and translation and utilizes objects with feminine, working class, and Mexico-U.S. border-specific associations. Madrigal combines these topics to reflect on nostalgia and loss in this series. By altering gender-coded objects, Jose Villalobos reflects on rules and confines of masculinity, and how queerness can collide with familial expectations and presumed duties. Through portraiture and additions of text, Andrei Rentería examines persistent physical traumas and loss with implicit sources in state and drug violence. In two white neon signs, Mark Anthony Martinez takes dominant phrases used to (ineffectively) brush aside white supremacist logic, and turns them on their heads by redirecting their subject to whiteness. Ashley Mireles’s black and white prints of women film stars portrayed in saintly iconography offer a reflective yet lighthearted consideration of sexism, and the iconographies produced by syncretism. YLA 22: ¡Ahora! is on view at Mexic-Arte Museum (419 Congress Avenue, Austin, Texas) through August 27, alongside Mark Menjivar’s project Capricho.